Holding area for various items infrequently used on homepage. All morning sports are cancelled in an effort to facilitate snow clearing. At this time, all afternoon activities and meetings beginning at 3:30 PM are expected to continue as scheduled. Please watch the website for any changes to this announcement. Our facilities team and private plowing company will continue to clear the property, but we continue to remind everyone to use caution and common sense when traveling to and from St. Clare's. All activities and programs including School, Religious Education classes, CYO Sports, Dance Program, parish meetings and Mass schedules will resume regular schedules on Wednesday, January 28, 2015. Our facilities team and private plowing company have done a terrific job clearing the property, but we continue to remind everyone to use caution and common sense when traveling to and from St. Clare's. A decision has been made to continue all parish activities for Monday, March 3rd. This includes the opening of School, Early Childhood Program, evening Religious Education classes, sports, and all parish activities at their regularly scheduled times. Please remember to use caution and give yourself plenty of time when traveling to/from St. Clare's. Although school and early childhood program classes are cancelled for today we will resume all regularly scheduled activities beginning at 3:00 PM, unless otherwise noted on the calendar below. Please continue to use caution when travelling, parking, and walking as the snow piles are large and the melting will naturally cause some unavoidable discomforts. Due to the forecast of dangerous weather conditions, including serious icing, and out of concern for the safety of our students, parents and staff, all parish activities including School, Early Childhood Program, Religious Education classes, sports, and parish meetings are cancelled for Wednesday, February 5. All scheduled Masses will be celebrated in the chapel. At this time school and the Early Childhood Program remain open. Benediction and throat blessings are also cancelled. After Care remains scheduled, but parents are encouraged to come as early as possible to pick up their children. Religious Education classes are cancelled. All sports practices for today are cancelled. All afternoon and evening parish meetings are cancelled. Tonight's Healing Mass is cancelled. All CYO games and practices are cancelled. All Boy Scouts & Cub Scouts are cancelled. All activities remain scheduled at this time. Please use caution and personal judgment if conditions necessitate. Watch this site for any changes pending weather conditions. At this time all parish activities remain scheduled for Saturday, December 14th including morning masses, religious education, sports, and meetings. The Breakfast with Santa at the Grand Oaks Country Club remains scheduled to start at 9:00 AM. 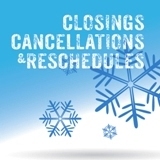 School and Early Childhood Program remain open for regular schedules and After Care. All other afternoon and evening meetings, activities, and sports at St. Clare's are cancelled for Tuesday, December 10th. Photo above was taken inside our Early Childhood Program as children take turns watching the snow come down! The National Night of Prayer for Life has been cancelled. All other parish activities remain scheduled including masses, school, sports, and meetings. School, Pre School, Religious Education and Dance classes are all cancelled for today. All sports practices are cancelled, in both gyms. THANK YOU! We have surpassed our parish pledge goal of $200,000. All payments made over our goal will be returned in the form of a rebate to be used by St. Clare's for its ongoing expenses. For more information of to confirm your participation in this year's appeal please contact the rectory or visit the appeal website directly at www.cardinalsappeal.org.